In this article, we will discuss the steps involved in configuring WooCommerce USPS Shipping on your WordPress site. WooCommerce store owners struggle a lot in managing efficient shipping for their businesses. While WooCommerce comes with its own suite of settings to configure your shipping, it falls short on several counts. Prime among them is the absence of support for third party shipping carrier services and options. Sure, you can configure flat rate shipping and let your customers pick it. But this would mean packaging, handling and shipping will have to be done by you. Manually. While this is feasible for WooCommerce stores that are just beginning out, it is just not manageable when you scale it up. 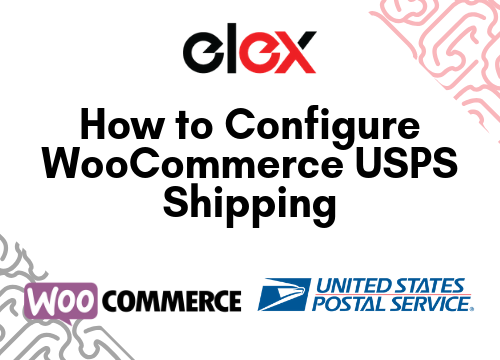 Using ELEX Plugins for WooCommerce USPS Shipping, setting up and managing efficient shipping is very simple. USPS is one of the best shipping carriers in the world. Integrating their services has many benefits. For starters, being able to outsource shipping to industry experts with a decade of experience, and at affordable rates too. Moreover, WooCommerce USPS Shipping lets you enable Live Rates, Estimated Shipping Dates and Label Printing in bulk as well. You can even manage all of your returns efficiently from WooCommerce itself. Choosing between the plugins depends on what your needs are. If you are a WooCommerce store owner that is also USPS e-VS vendor, you can use ELEX WooCommerce USPS Shipping Plugin with Print Label’s seamless e-VS integration. Electronic Verification System facilitates high-volume package shipments, documentation and postage payment, that includes special service fees. It uses electronic manifest files that are sent to an online USPS Service database. Moreover, it lets you configure bulk e-VS shipments and print out shipping labels. The free version of this plugin can be downloaded from here. 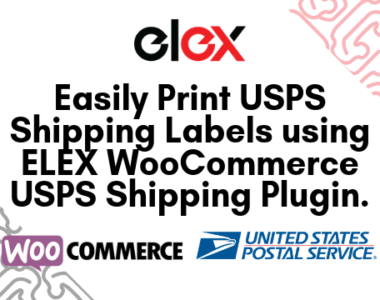 The ELEX EasyPost (FedEx, UPS & USPS) Shipping & Label Printing Plugin for WooCommerce can also do the trick. 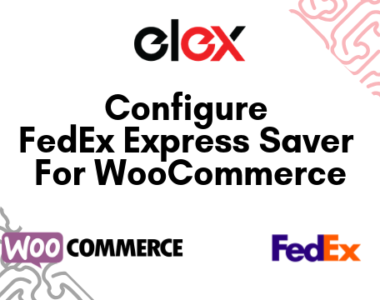 What’s more, this plugin can help integrate UPS and FedEx shipping into WooCommerce. As such the plugin comes featured packed for configuring shipping methods and options from these carriers. You can download the free version here. 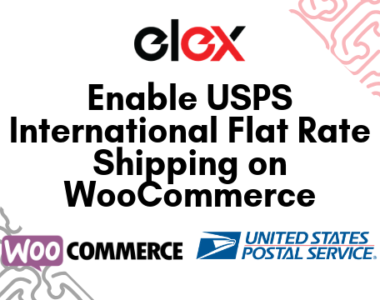 ELEX Stamps.com Shipping Plugin with USPS Postage for WooCommerce is for WooCommerce stores that do not need USPS e-VS. This plugin also supports the complete integration of WooCommerce USPS Shipping methods. Enabling Live USPS shipping rates, estimated shipping dates, bulk printing shipping labels, managing returns, support for USPS Flat Rate boxes can be done using this plugin. For this article, we will be using this plugin to integrate WooCommerce USPS Shipping. You can download the free version here. You will be needed an account in Stamps.com for using this plugin. It charges a small monthly fee apart from what you pay in shipping, postage, and label printing. Here’s a tutorial on how to get and install the plugin. Once it is installed and activated, you can find the settings to configure the plugin, under WooCommerce > Settings > Shipping > Stamps.com- USPS. Under the plugin’s General Settings, you will need to provide you Stamps.com Login Username and Password. Additionally, you can toggle Debug Mode and choose the Test mode from the API Mode dropdown for testing and debugging purposes. Additionally, this plugin can help you configure insurance for shipments through Stamp.com. Taking insurance cover for your WooCommerce USPS Shipments is both money and time-saving. Claims are usually processed in under 7 to 10 days. What’s more, there are no forms to fill and there’s no need to visit the post office. If you wish to enable Stamps.com package insurance, simply tick the checkbox next to Insurance. You can choose to enable or Disable real-time Rates in the plugin settings. Enabling this will show customers the live rates under each configured shipping option. You can choose to enable displaying only the cheapest shipping option for customers at checkout/cart pages. Unticking the box shows all the applicable shipping options and methods to your customers. They get to pick what option they want. 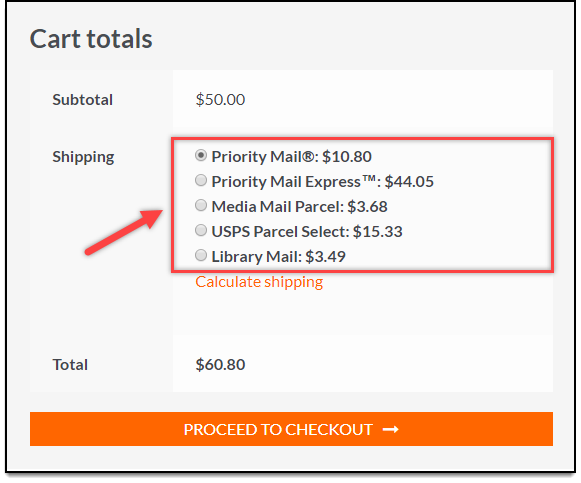 Configure Fallback rates for WooCommerce USPS shipping options. When a product is added to the cart, an API request is sent to Stamps.com serves to fetch the price and estimated date. This is displayed on the checkout/cart page. In case there’s a problem with the servers and the API request fails to fetch the data, you can charge a flat fee for shipping. This lets the order go through without any hitch. The plugin lets you assign USPS Media Mail to WooCommerce Shipping classes. This ensures customers don’t pick the wrong shipping method. This plugin features complete support for all USPS Flat Rate boxes. Flat Rate boxes cost the same to ship to a particular place irrespective of where you are sending it from. Moreover, you can ship any product below 70lbs using one of the many Flat Rate boxes and envelopes. You can adjust the prices of all WooCommerce USPS shipping options. You can do this from the Rates & Services tab in the plugin settings. What’s more, you can adjust the price by a fixed percentage or a flat amount as well. This feature makes decreasing prices for promotional discounts or increasing prices to account for handling, packaging, etc, very simple. To generate USPS Shipping labels, you will have to give the sender details you wish to appear in the label, first. Next, you can choose the format of the label to be printed. The plugin lets you choose between PNG, GIF, PDF, and JPG formats. You can also set the Print Layout for further customization. If you choose the PDF format for generating labels, you can also set the paper size for printing the PDF. Choosing to enable Hidden Postage hides the shipping amount in generated shipping labels. It’s useful for customers that wish to hide shipping costs from the recipients of the package. The plugin also lets you set an offset value, in minutes, for shipment times if you wish. You can also enter a negative value to reduce the shipment time. This is especially great for accounting holidays or unforeseen hitches in operation into shipment times. The plugin even lets you assign a USPS Shipping option for default international as well as domestic shipments. First Class Package Service International. ELEX EasyPost (FedEx, UPS & USPS) Shipping & Label Printing Plugin for WooCommerce comes with three options for parcel packaging to choose from. The default option configures each item in the order to be packed in its own box and shipped individually. Choosing the Pack into boxes with weights and dimensions is recommended. When enabled Items will be packed into these boxes based on item dimensions and volume. Outer dimensions will be passed to EasyPost FedEx, whereas inner dimensions will be used for packing. Items not fitting into boxes will be packed individually. You will have to give the dimensions of the box including max weight in pounds. Choosing the Pack items based on weight lets you pick between Packing heavier items first, packing lighter items first or Pack purely divided by weight. You need to give a maximum weight first. Access real-time rates from USPS carrier. Option to prioritize Flat rates when they are offered with Package rates. Set a custom method title for Stamp.com-USPS shipping method. Option to customize each service name. Set a fallback rate to process shipments when USPS fails to return any shipping rate. The premium version lets you enable shipping insurance, tracking, parcel packaging algorithms and more. You can find more information about this plugin here.